The tortuous jurisprudence of Antonin Scalia. Conservatives now have only the courts to carry on their thirty-year battle against entitlement liberalism, and only Antonin Scalia to bear their standard. Scorning other justices, who have refused to take some of the positions for which they were appointed, conservatives hail Scalia as the only justice guided by principle rather than politics. Scalia is the purest archetype of the conservative legal movement that began in the 1960s in reaction to the Warren Court. His increasing inability to command majorities is viewed as proof of his virtue. From a dramatic standpoint, too, Scalia stands out. Of the three justices who regularly write their own opinions (David Souter and John Paul Stevens ate the other two), only Scalia writes with flair. At his most melodramatic, he is more entertaining than the best Wall Street Journal editorial writers: "It is instructive to compare this Nietzschean vision of us unelected, life-tenured judges, leading a Volk who will be tested by following, with the somewhat more modest role envisioned by the Founders," he wrote in his abortion dissent last June. Scalia is also a showoff at oral argument, to the obvious irritation of his colleagues. When a lawyer tried to defend the FCC's set-aside program for black broadcasters, arguing that their background had given them a unique perspective, Scalia exclaimed: "Blood, Mr. Wollenberg, blood! Not background and environment. Isn't that right? Blood!" At times, Scalia seems the only justice large enough for the role he has been assigned to play. Since being a judge, I have had a uniform policy of declining interviews for articles about me. That policy undoubtedly has its costs, but is in accord with our judicial tradition of avoiding publicity. (As you know, for a big on tradition.) It is tempting to make an exception for a piece of the rare sort you describe, but a rule is a rule. (I am also big on rules.) I am sorry to disappoint--and wish both of us good luck in your article. Scalia's speeches and opinions provide more details of the judicial philosophy that he called, in his 1989 Holmes Lecture at Harvard, "The Rule of Law as a Law of Rules." When interpreting statutes, Scalia claims to be a "textualist," refusing to look beyond the "plain meaning" of the words for evidence of the original intentions of Congress. When interpreting the Constitution, however, Scalia claims to be an "originalist," insisting that each provision should be interpreted in light of the original understanding of its framers and ratifiers. Finally, and most controversially, Scalia says that judges should refuse to enforce rights that do not appear explicitly in the Constitution unless they are rooted in long-standing tradition or very specific historical practice. Above all, Scalia claims to be consistent. "The only check on the arbitrariness of federal judges," he wrote in a 1989 issue of the Case Western Law Review, is "the insistence upon consistency." Radical self-restraint. Scrupulous attention to text and history. Consistency. These ate exacting principles, but Scalia properly demands to be judged by them, and he deserves to be taken seriously. In some cases, admirably, Scalia's principles do restrain his passions. Unfortunately, in the cases Scalia feels most deeply about, his passions lead him to betray his principles. In constitutional interpretation, he has ignored of misrepresented evidence of the original understanding of the framers and ratifiers when it conflicts with his own policy views. In statutory interpretation, he has ignored of misrepresented the "plain meaning" of the text in ways that Congress clearly did not intend. For all his self-righteousness, in short, Scalia often chooses among conflicting principles--textualism, originalism, tradition and precedent--in ways that appear no less restrained than justices who do not c]aim to be guided by systematic principles in the first place. Affirmative action is a dramatic example of how Scalia's personal preferences seem to get the better of his originalist methodology. Scalia has never disguised his scorn, as the son of an immigrant from Sicily, for the idea that he should alone for the sins of earlier immigrants. In a brutally autobiographical essay in the 1979 Washington University Law Quarterly, he confesses his ethnic resentment of WASP judges like "the Wisdoms and the Powells and the Whites," whose ancestors oppressed blacks and who now try to rectify the error through affirmative action programs at the expense of more recent immigrants. "My father came to this country as a teenager," Scalia wrote. "Not only had he never profited front the sweat of any black man's brow, I don't think he had ever seen a black man." Given Scalia's law feelings on the subject, one would expect him to tread gingerly in considering the constitutionality of affirmative action. Instead, his opinions are remarkable for their failure to apply the originalist methodology and to examine the contemporary understanding of the Fourteenth Amendment. In a 1989 case, City of Richmond v. J.A. Croson Co., O'Connor struck down a set-aside program for minority contractors, holding that states can discriminate on the basis of race only to "ameliorate the effects of past discrimination." In Scalia's view, O'Connor's position was too moderate: "Only a social emergency rising to the level of imminent danger to life and limb" could justify an exception to "the principle embodied in the Fourteenth Amendment that '[o]ur Constitution is color-blind, and neither knows nor tolerates classes among citizens.'" Scalia offered no historical support for this sweeping proposition except for two irrelevant quotations: one from James Madison on the dangers of faction, and another from Alexander Bickel on the immorality of racism. Scalia conspicuously ignored an amicus brief for the NAACP, written by Eric Schnapper of Columbia Law School, arguing that the framers of the Fourteenth Amendment not only tolerated, but voted for social welfare programs for the exclusive benefit of blacks. Administered by the Freedman's Bureau, the programs were open to all blacks, not only to recently freed slaves; and the offered assistance--which included land, education, job training and employment set-asides--was not in any way tied to the injury suffered by the recipient. A judge who claimed to be less bound by the specific understanding of the framers and ratifiers might be able to interpret the text of the amendment (no person shall be deprived of "the equal protection of the laws") more generally, but Scalia offers no excuse for ignoring his originalist principles. Three major opinions Scalia issued last June--on property rights, exclusive power and school prayer--provide more specific evidence of how his political passions overwhelm his originalist principles. In Lucas v. South Carolina Coastal Council, Scalia held that when the state regulates land in a way that strips it of economic value, the landowner must be compensated, unless the prohibited use of the land was a nuisance under state common law. Scalia conceded that the framers would not have applied the Takings Clause ("private property [shall not] be taken for public use, without just compensation") to economic regulations: they understood it to cover only the physical taking of land. But instead, he relied on a subjective test Justice Oliver Wendell Holmes made up in 1922: a regulation is unconstitutional if it "goes too far" in reducing the value of land. This sounds very much like the mushy, judge-created "undue burden" test that Scalia attacked in Planned Parenthood v. Casey, the abortion case. And in a 1990 decision, Scalia took precisely the opposite approach, insisting that police officers who chased a teenager did not "seize" him, because the Founders understood "seizures" to be limited to physical contact. In Lujan v. Defenders of Wildlife, Scalia again violated his originalist principles when he struck down scores of statutes in which Congress had allowed citizens to sue the president for his refusal to enforce environmental laws. In 1983, as a law professor, Scalia had written an article in the Suffolk Law Review proposing the theory on which the decision rests: if you are the object of a legal regulation, Scalia wrote, you should always have "standing" to challenge an agency's failure to enforce it; but sometimes even Congress cannot give you "standing" to challenge an agency's failure to regulate someone else. The problem, as Cass Sunstein of the University of Chicago argues in the November issue of the Michigan Law Review, is that Scalia's neat theory clashes dramatically with the original understanding and historical practice in England and America. Sunstein shows that the citizen suit was well established in the eighteenth and early nineteenth centuries; to establish "standing" throughout most of American history, you merely had to show that Congress or the common law had given you a right to sue. Scalia's conclusion that Congress can never grant standing to challenge the president's failure to enforce the law is, in short, perverse. But instead of examining the historical evidence, be relied heavily on an incoherent case from the 1970s, written by the liberal activist William O. Douglas, which is clearly inconsistent with the text and original understanding of the Constitution. Although Scalia dismissed the majority opinions as "conspicuously bereft of any reference to history," Souter's concurrence, in fact, reviewed the evidence of the framers' intentions in meticulous detail, concluding that "history neither contradicts nor warrants reconsideration of the settled principle that the Establishment Clause forbids" nonpreferential as well as preferential support for religion. Scalia simply ignored Souter's arguments about the intent of the framers. Instead, he disingenuously shifted his focus from original intention to subsequent practice or "tradition." He made much of the fact that presidents have traditionally, issued Thanksgiving proclamations. But as Souter took pains to point out, Madison later apologized for his Thanksgiving proclamation (which he had issued only to win the War of 1812) on the grounds that he felt all ceremonial uses of religion "a palpable violation of... Constitutional principles." And in a footnote in his abortion dissent, Scalia had argued that "tradition" can never trump a right enumerated in the Constitution. Scalia's failure to engage Souter's originalist arguments leaves the impression that he has nothing to say; and Weisman will be remembered as the case in which Souter challenged Scalia on his own terms, and won. Scalia applies his "plain meaning" methodology in statutory interpretation as inconsistently as he applies his "originalist" methodology in constitutional interpretation. There is an apparent tension, first of all, between Scalia's insistence on consulting extrinsic evidence of the framers' intentions and his refusal to consult extrinsic evidence of Congress's intentions. Scalia's response is that "legislative history"--especially committee reports--is often unreliable evidence of the intentions of the average congressman. But even if Scalia is correct, he has repeatedly interpreted the "plain meaning" of laws in ways that thwart Congress's clearly expressed intentions. Scalia wrote two of the seven opinions that Congress repudiated in the Civil Rights Act of 1991, and most of the other five relied on his "plain meaning" methodology. In some of the cases, the Court misconstrued intentions that Congress had expressed precisely the first time. In a 1991 case, for example, the Court held that Congress did not intend the Civil Rights Act of 1964 to apply to American companies employing Americans abroad. Although in recent cases the Court had presumed that Congress intended laws to apply overseas unless it explicitly said otherwise, Chief Justice William Rehnquist and Scalia resurrected an older rule, applying the opposite presumption. But they also ignored explicit language in the Civil Rights Act, declaring that Congress did not intend it to apply to American employers who hire aliens abroad. As Stevens pointed out in dissent, if the statute was not intended to apply outside the United States, the exception for aliens would have been unnecessary. In 1982 Congress amended the Voting Rights Act to prohibit unintentional, as well as intentional, discrimination. Congress obviously intended the amendment to extend the scope of the act, which had always been understood to cover the election of state judges as well as state legislators. In two 1991 dissents, however, Scalia pounced on language in the amendment about giving voters the chance "to elect representatives of their choice." He argued that elected judges are not representatives "within the ordinary meaning of language"; so judicial elections should no longer be covered by the extended Voting Rights Act. Scalia seemed to relish the prospect of forcing Congress to live with a perverse result that it had not anticipated. The centerpiece of his odd argument: if all elected officials were "representatives," the Voting Rights Act would cover "the fan-elected members of the baseball All-Star Teams." Finally, Scalia has joined habeas corpus cases in which the misconstructions of Congress's "plain meaning" seem even more willful. Over the past four years, Rehnquist has lobbied Congress to amend the habeas corpus statute in a way that would eviscerate it, requiring federal courts to defer to state courts if their legal judgments are "reasonable," rather than deciding independently if the judgments are correct. Congress has repeatedly rejected Rehnquist's proposals. Last June, however, Thomas, Scalia and Rehnquist not only indicated their willingness to adopt the relaxed standard of review, they denied that Congress had repeatedly rejected it. Instead of overruling the Warren Court cases that Congress had codified, all three pretended the cases meant the opposite of what they said. In an exhaustive survey for the Yale Law Journal of all Supreme Court opinions repudiated by Congress in the last twenty years, William Eskridge of Georgetown Law School discovered that more than half relied on Scalia's methodology of "plain meaning" or general rules of construction. Only 20 percent of the decisions that were overturned relied primarily on legislative history. Scalia claims that being repudiated by Congress does not bother him, since his goal is to encourage Congress to express its meaning more precisely. But his tendency to misconstrue Congress's meaning even when it is precisely expressed suggests that his methodology often fails on its own terms. Former Scalia clerks insist that Scalia genuinely struggles to be guided by principle rather than politics and is not aware of his own inconsistencies. "He is fundamentally Catholic and Christian," said one clerk, "and wants to believe what he is doing is true and good." In an early review of Scalia's jurisprudence, George Kannar of the University of Buffalo attributed Scalia's "constitutional catechism" to his education at a Jesuit military academy in Queens. 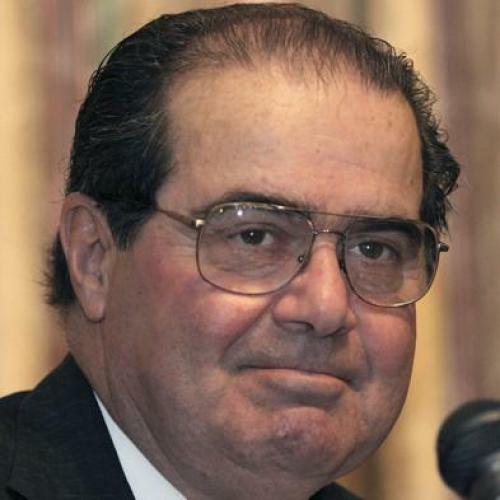 Politically and religiously, Scalia was an archconservative in high school. "At the age of 17," William Stern, a high school friend, told The New York Times, "he could have been a member of the Curia." In the 1950s Scalia moved on to Georgetown and Harvard Law School, where he was steeped in the Legal Process school of Felix Frankfurter and Henry Hart, with its scrupulous concern for neutrality and restraint. But Kannar argues that Scalia's religious education began his struggle to separate his personal preferences from his actions, to be "strong enough to obey." In this respect, Scalia bears a striking resemblance to another legal purist of the conservative Kulturkampf, Joseph Ratzinger, whose own Augustinian submission to the will of the law has just produced a new universal Catholic catechism. In the cases where Scalia's passions are less engaged, there is no doubt that his principles sometimes do lead him to libertarian positions that conflict with his pro-executive politics. "Scalia's judicial asceticism requires him to reach results that ate unjust," says Larry Kramer of the University of Michigan. "He reaches a result, he knows it's unjust and now he feels good about himself because he knows the law controls him, because this is a result he knows is crazy." A more sympathetic way of putting the same point is that Scalia sometimes enjoys being forced by his principles to take positions with which he disagrees. This distinguishes him from colleagues like Rehnquist and Byron White, who are so result-oriented that they often remove the legal reasoning from the drafts of their clerks. In a 1991 dissent, for example, Scalia's examination of colonial common law led him to conclude that a suspect could be held without a probable cause ruling for only twenty-four hours (O'Connor thought forty-eight hours was "reasonable"). In a recent speech at Harvard Law School, Scalia pointed to a 1987 dissent in which he held that a search and seizure had occurred as soon as a policeman touched a stereo. "I let people burn flags," Scalia added proudly. In short, even though Scalia often betrays his jurisprudential principles, these cases show that he deserves respect as one of the few justices who has a jurisprudence to betray. Why do Scalia's passions overcome him in the most controversial cases? Part of the problem is the lack of intellectual debate among the justices of the Rehnquist Court. Traditionally, justices discussed their reasons before voting at conference; but Rehnquist, who is concerned about efficiency above all, changed the rules of the conference so that the justices now go around the table only once, to announce their tentative votes. There is also tremendous pressure to join draft opinions as soon as they circulate. Scalia, to his credit, has publicly proposed that no opinions should be joined until the dissent has circulated. For now, however, there ate few opportunities for Scalia's colleagues to save him from his worst instincts. But the most convincing explanation for Scalia's inconsistencies is that arrogance has blinded him to them. After interviewing scores of law clerks last April, Paul Barrett of The Wall Street Journal confirmed what is obvious from Scalia's published opinions and questions at oral argument: that he has intellectual contempt for most of his colleagues. "What's a smart guy like me doing in a place like this?" he periodically asks his own clerks. Because his colleagues seldom check his excesses by engaging his arguments, his treatment of constitutional history has grown increasingly cavalier. Privately dismissing O'Connor and other justices as "politicians," he has convinced himself, as he wrote in a 1989 abortion dissent, that their less categorical approach to judging "cannot be taken seriously." As a result, Scalia has been slow to acknowledge the rise of David Souter, an intellectual equal who is proving to be more scholarly, and less political, than Scalia himself. As Souter does the hard and lonely work of original historical research, many of Scalia's best ideas are increasingly derivative. In RAV v. St. Paul, the cross-burning case, for example, Scalia's ingenious extension of the First Amendment (he held that even fighting words and obscenity cannot be regulated selectively) was suggested by an amicus brief on behalf of the libertarian Center for Individual Rights, which relied on decisions by Richard Posner and Frank Easterbrook, two esteemed appellate judges in Chicago. Eventually, Frankfurter lost the majorities he had commanded in his earliest years. His most cherished decisions were overturned--he had briefly convinced his colleagues to uphold mandatory flag salutes for Jehovah's Witnesses--and he was reduced to increasingly bitter and personal dissents. Today Frankfurter's stock among scholars is very low: many of his historical claims have been exposed as dishonest; his pro-executive bias appears sycophantic; and his sanctimonious claims about being guided by principle rather than politics seem self-deluded. The resemblance continues to grow. One of Scalia's most controversial opinions, Employment Division v. Smith, said that "neutral laws of general applicability" do not violate the First Amendment, even if they have the "incidental effect" of making it impossible for minorities to practice their religion. The precedent on which Scalia based his theory, amazingly, was Frankfurter's infamous opinion in the flag salute case. (Scalia ignored the fact that the decision had been overturned.) In a 1991 case, Souter criticized Scalia's theory; and scholars have collected extensive evidence-which Scalia also ignored--suggesting that the framers of the First Amendment intended to make exceptions for religious minorities. Eventually Souter could persuade a majority that Scalia's theory has no basis in the First Amendment, just as Black eventually abandoned Frankfurter. Jurisprudentially, however, the roles have been reversed. Scalia claims to embrace the principles of Black: strict construction, constitutional literalism; objective rules over subjective standards. Souter, in turn, has taken up the mantle of Frankfurter and his disciple, John Harlan: respect for precedent; case by case balancing; Burkean continuity with the past. Souter's Harlanesque approach has its virtues, but at its worst, it leads to a refusal to work the law pure, preserving precedents---like Roe v. Wade--that were wrong from the start. In Black's hands, by contrast, strict constructionism led to some of the greatest civil libertarian decisions of the century, as well as to some of the most impressive demonstrations of judicial restraint (such as Black's dissent in Griswold v. Connecticut, the contraceptives case). Black's principles are worthy principles; they deserve a champion who can apply them more consistently than Scalia has done. Many of the conservative criticisms of the Warren and Burger Courts, furthermore, were worthy criticisms. They should not be obscured by the hypocrisy of conservative judges, who have proved no less political--but far more self-righteous--than their liberal opponents. Instead of continuing to use the courts as an instrument of politics, President Clinton could end the cycle. He could appoint scholarly, principled justices--political liberals as well as conservatives--whose politics are genuinely distinct from their jurisprudence. (When interpreted scrupulously, constitutional text, history and structure should lead to liberal as well as conservative results.) As for Scalia, with some recognition of his own fallibility, he could play a genuinely constructive role in the future, rather than being reduced to writing sarcastic editorials. The best gift that Clinton could give to liberals and conservatives would be colleagues capable of challenging Scalia on his own terms. Perhaps the Clinton justices could also persuade Scalia to re-examine his most conspicuous misreading of text and history, which occurs in his statement of principle itself. "I stand with Aristotle," Scalia says, in the view that law should be understood as a system of rules, rather than an exercise of personal discretion. But as Richard Pildes of the University of Michigan points out, this turns Aristotle on his head. Aristotle rejected the formalistic view of law as a series of fixed principles. Instead of applying straight rules to fluted columns, Aristotle argued in the Nichomachean Ethics, judges should be guided by the Lesbian Rule, a flexible strip of metal, used by the builders of Lesbos, that "bends to the shape of the stone and is not fixed." By betraying many of his own principles, Scalia proves a more faithful Aristotelian than he intended.